Is The Fed Ready To Turn Hawkish? The Fed begins its two-day FOMC meeting this morning. Conventional wisdom anticipates no change in rate policy. Conventional wisdom is correct in this instance. The Fed will stay on the sidelines for Chair Janet Yellen’s final meeting. The statement itself will likely be somewhat more upbeat relative to the December statement. With another quarter of solid economic growth and some firming of inflation in recent months, the risks to the outlook should shift from “roughly balanced” to just “balanced.” Overall, I expect the statement to leave little doubt that the Fed will return to rate hikes in March. A March rate hike would be the first of the three anticipated in 2018 by the median FOMC policymaker according to the December Summary of Economic projections. Those three rate hikes remain a reasonable baseline. My expectation is that the hawkish tilt of both the voting rotation and the new leadership will dominate over the more dovish voices of last year. Solid data on the trajectory of the economy, including continued gains in the labor market, will almost certainly keep the Fed committed to rate hikes even if inflation again surprises on the weak side. The strength of recent data on the back of a solid global cyclical upswing leads to the reasonable conclusion that the Fed could shift to a more aggressive pace of rate hikes. Easy financial conditions – arguably the easiest since the early 1990s – further supports this possibility. Indeed, it seems as if an FOMC with a more hawkish tilt would seize upon these factors to justify a fourth rate hike this year or even a surprise 50 basis point hike midyear. But will the FOMC indeed turn hawkish? And under what conditions? And what are the market implications? With these questions in mind, I have been considering a variety of scenarios and the potential investment implications. One concern is how the Fed would respond to a surprise jump in the inflation numbers. In theory, they should respond in the same way in which they responded to the surprise inflation shortfall in 2017. Rather than slowing the pace of rate hikes, they instead stayed the course on the planned three rate hikes and the initiation of balance sheet reduction. If the Fed is treating its inflation target symmetrically, they should then respond to a positive inflation shock by again staying the course. In other words, they should remain focused on the medium-term forecast and not overreact to above target inflation. Moreover, the closer policy moves to the neutral rate, the greater the possibility that an overreaction to higher inflation turns policy too tight and triggers a recession. Consequently, extra caution is warranted and argues against an acceleration in the pace of rate hikes. Under this scenario, I would anticipate the yield curve to shift upward or steepen further in the near-term, essentially a continuation of recent trends. Be wary, however, of the idea that this implies longer term yields will blow out. I don’t think that the fundamental factors (saving glut, investment shortage, demographics) holding down long-term rates have eased yet. Consequently, my expectation is that similar to recent run-ups in long rates, buyers will find opportunity as the yield on the 10 year exceeds three percent. Moreover, the long rate currently benefits from a global cyclical upturn. It will lose support when that upturn plays out later in the year. 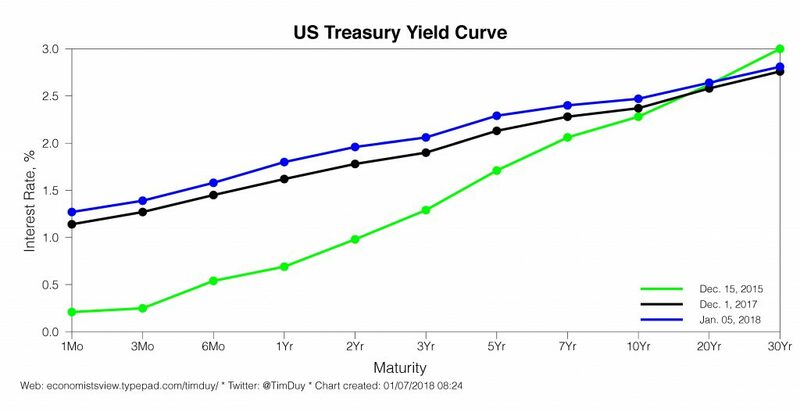 If this occurs, the cycle will shift back to yield curve flattening (assuming the Fed stays on track for another three hikes in 2019). 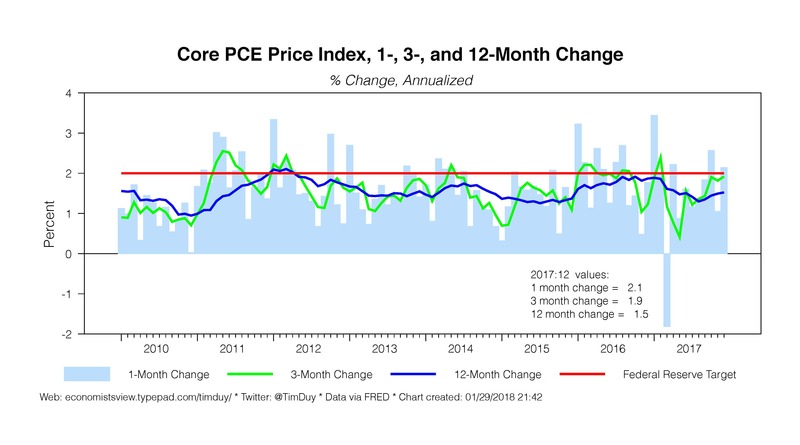 I think that if you are looking for even higher rates, you likely need more than just an inflation surprise, you need a sustained change to the inflation dynamic that the Fed does not seem inclined to get in front of. That would push up term premiums and create the kind of environment more supportive of higher rates. That said, I wouldn’t expect that out of the Yellen Fed, and certainly not out of a more hawkish leaning Powell Fed. Arguably, this assumes too much patience on the part of the Fed. 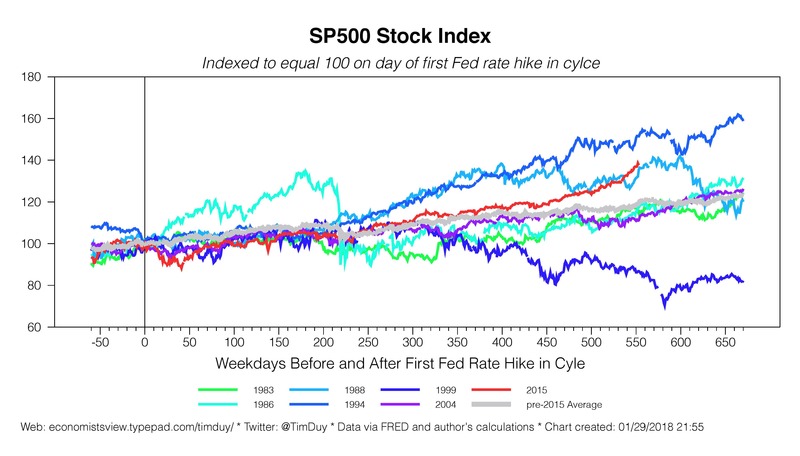 Historically, the Fed tends to overreact late in the cycle and forgets about those pesky long and variable lags in monetary policy. A more hawkish Fed would arguably be more prone to making this mistake. Under these circumstances, I would be very wary of shorting the long end of the curve. This scenario suggests instead a resumption of the yield curve flattening experienced for most of this cycle. An arguably even more bullish scenario for longer-term yields would be a Fed that turns hawkish not due to inflation, but in response to frothy financial markets. My suspicion is that the Fed would break the economy in the process of trying to tame the behavioral forces carrying risk assets higher. In that case, the Fed would be holding policy tight while the economy and financial conditions rolled over. That would be bad. Finally, another possibility you should have on your radar is a potential rate cut. A catalyst might come along that reverses the current psychology on Wall Street and sets in motion a price correction. My expectation is that the Fed would respond to a substantial correction by either delaying expected rate hikes or, if needed, even a rate cut. Yes, the Fed will face withering criticism that the it only continues the Greenspan put. But I don’t think that ultimately either Wall Street or Main Street would like a world in which the Fed doesn’t respond when needed. Bottom Line: At this point, I don’t think we can be confident that a Powell Fed would be demonstrably more hawkish than a Yellen Fed. Indeed, I think you can argue that the Yellen Fed had a hawkish tilt by holding the line on policy despite low inflation. Consequently, a continuation of that policy in the face of inflation surprises would yield a dovish tilt to the Powell Fed. And that it seems to me remains the best bet in the absence of further policy guidance. As that guidance arrives, I will update my expectations accordingly. Minneapolis Federal Reserve President Neel Kashkari and other prominent officials have argued that the central bank should come well short of the 75 basis points of rate hikes anticipated by the median policy maker in the institution’s survey known as dot plots. But what about the other side of the story? 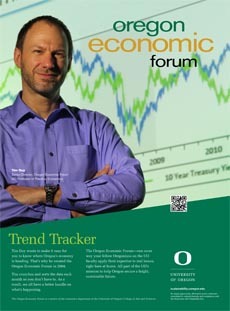 There were four dots above the median rate expectation in the most recent Summary of Economic Projections. Although these hawkish policy makers will make some noise — for instance, Boston Federal Reserve President Eric Rosengren recently reiterated his expectation of more than three rate hikes this year — they probably won’t get much traction in policy debates without even stronger data. Note: A case of the flu kept me down all of last week, but I am now recovering. As such, Fed watching has been on the slow side lately. This rally in equities could be described as “frothy,” but that might not be a sufficiently strong adjective. These days often feel like the late 1990s, when it seemed any company that added “dot-com” to its name was instantly rewarded by investors, even if the label amounted to little more than putting lipstick on a pig. That phenomenon isn’t entirely unlike the bounce in Kodak’s stock price after the company announced the launch of its own cryptocurrency. It feels like we have been here before, and it didn’t end well for the economy. Will this time be the same? Atlanta Federal Reserve President Raphael Bostic – a voting member of the FOMC this year – took to the podium yesterday, delivering a dovish speech that makes clear he is open to the possibility of a less-than-expected path of rate hikes this year. Looks like a number of factors are playing into his analysis, the most interesting of which to me is a reduced expectation of the neutral level of interest rates. This is something to keep an eye on. On net, Bostic comes down on the soft side of the Fed’s median GDP forecast for 2018. Whereas the median policymaker is looking for 2.5 percent growth, Bostic is comfortable with 2.2-2.5 percent. He does not anticipate much follow through from recent stronger growth numbers for three reasons. 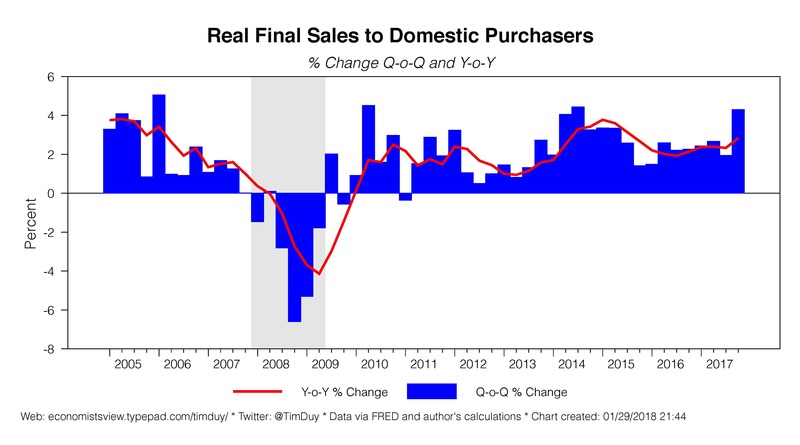 First, he is already looking for a first quarter slowdown attributed to seasonal effects. In other words, he thinks a portion of the last three quarters of strong growth is simply an offset for the first quarter (FWIW, I think he may be underestimating the underlying strength of the economy on this point). Second, he attributes some of the recent growth to the transitory impact of hurricane rebuilding (again, thinking this may be overplayed). 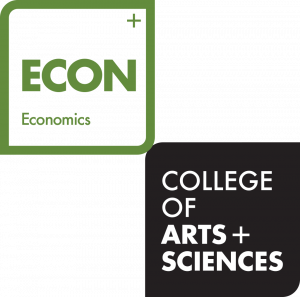 Third, he reports survey and anecdotal evidence that firms are not expecting stronger growth. Nor does he anticipate a substantial boost from tax cuts, seeing more of an upside risk than anything else. That suggests a fairly sharp slowdown in job growth given the Fed’s labor force growth forecast. That said, this disconnect between the economic forecast and unemployment forecast is consistent with that of his colleagues. …Recent evidence suggests that the interest rate that would prevail when GDP and inflation are back on target could be close to 2 percent at the moment, and may rise only modestly over the medium term. Under my baseline scenario, I think it will be appropriate for interest rates to rise gradually over the next couple of years, as our policy position is still very accommodating rather than neutral. Did one rate hike in the intervening time take policy from “very accommodating” to “somewhat accommodative”? Doubtful. This seems to reflect more of shift in Bostic’s view of the neutral rate, following in the footsteps of Federal Reserve Governor Lael Brainard. Bottom Line: Bostic looks to be leaning dovish, more so due to a changing view of the neutral rate than to his economic outlook. Watch to see if more of his colleagues move in this direction. My sense is that it would only take a few stronger inflation readings for Bostic to back off on this line of thought. I also wonder that the consensus central banker would have an easy time reconciling the idea that policy is close to neutral when financial conditions appear to have only eased since the Fed began tightening. Altogether, this is clearly a space to keep an eye on. Nonfarm payrolls grew a less-then-expected 148k in December. Still, after some mildly net negative revisions to previous months, jobs grew an average of 205k per month over the final quarter of the year and 171k per month over the last twelve months. Unemployment held steady per expectations, but the pace of job growth remains well in excess of that necessary to pull the unemployment rate down in the months ahead. 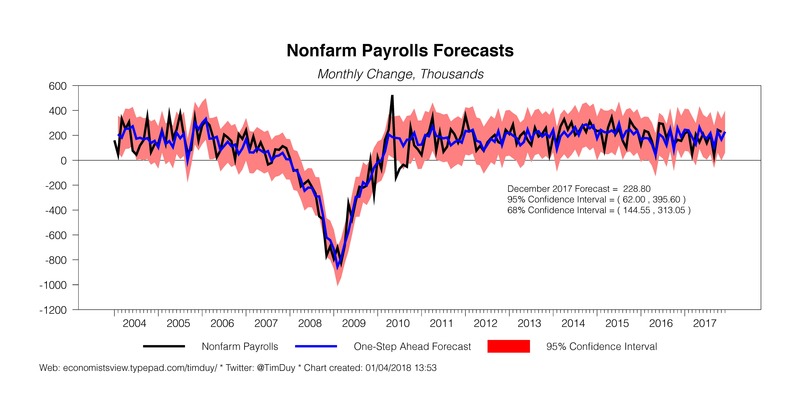 This is key for the Fed; they would be more comfortable pausing rate hikes if job growth were something closer to 100k per month, a rate consistent with steady unemployment. 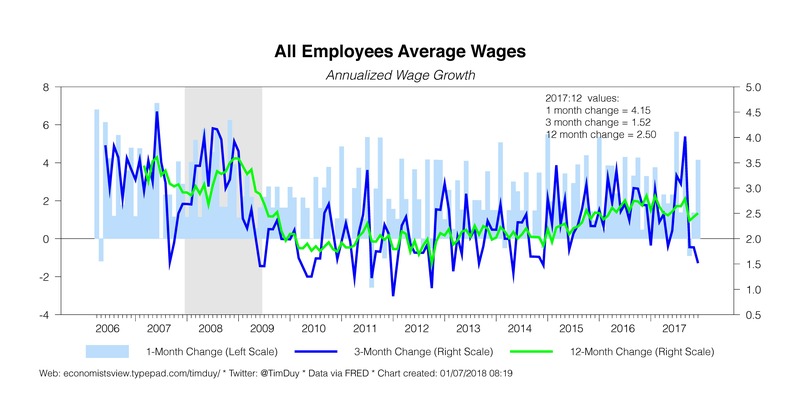 Claims of full employment by Fed officials notwithstanding, ongoing weak wage growth (up 2.5 percent compared to a year ago) suggests the economy does not face imminent danger of overheating. While wage growth looked to be accelerating in the third quarter, that hope was yet again dashed later in the year. This smells of lingering slack in the labor market. 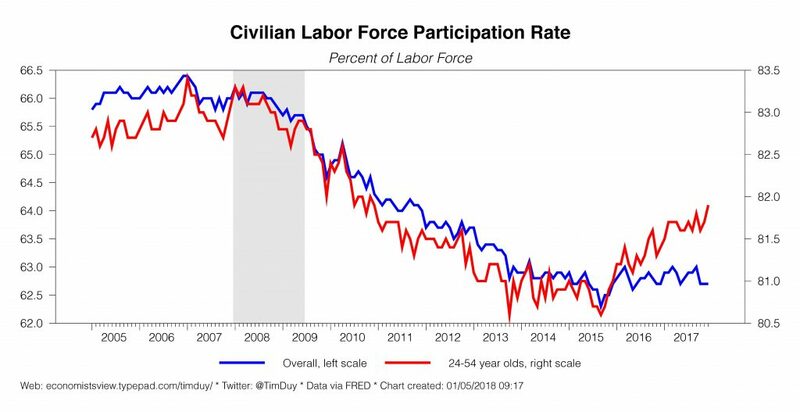 For example, see the continued gains in prime aged labor force participation rates with the possibility of more gains to come as the millennial generation becomes more integrated into the job market. Most participants reiterated their support for continuing a gradual approach to raising the target range, noting that this approach helped to balance risks to the outlook for economic activity and inflation. A few participants indicated that they were not comfortable with the degree of additional policy tightening through the end of 2018 implied by the median projections for the federal funds rate in the December SEP.
A few other participants mentioned that they saw as appropriate a pace of additional policy tightening through the end of 2018 that was somewhat faster than that implied by the December SEP median forecast. They noted that financial conditions had not materially tightened since the removal of monetary policy accommodation began, that continued low interest rates risked financial instability in the future, or that the labor market was increasingly tight. It appears to me that neither the dovish nor hawkish contingents within the Fed are of sufficient size to drive the conversation. That leaves the status quo of three 25 basis point rate hikes as still the best bet for 2018. The question is whether or not the status quo increasingly leans dovish in the face of continued inflation weakness. I hesitate to separate that issue from labor market strength. 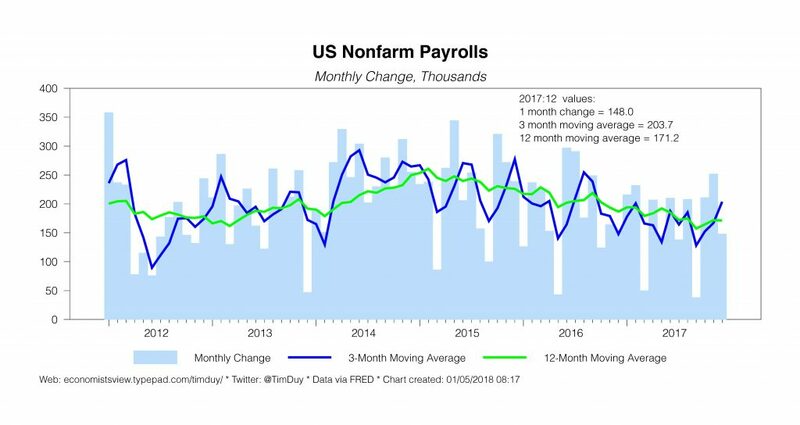 It seems to me that incoming data suggests healthy job growth is more likely than not going to continue in the year ahead. 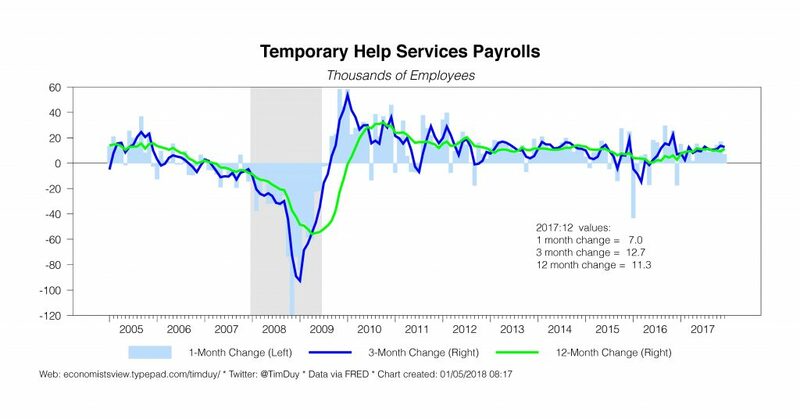 Initial unemployment claims remain low, temporary help employment continues to rise, and the overall economy looks to have gained some substantial momentum in 2017. All suggest continued solid employment gains and thus downward pressure on the unemployment rate. My sense is that the majority of the FOMC would continue to view such a situation as consistent with the gradual pace of hikes. What would cause the consensus to lean in the dovish direction? Two likely possibilities jump out at me. First is an evident slowing in economic activity that looks sufficient to cut job growth almost in half. Second is falling inflation rates; I bet that in the context of a strong economy near what they think is full employment they will hesitate to stop hiking rates even if inflation meanders at current rates. But a decline of inflation at this point would be untenable and would shift the discussion solidly toward the group most worried by the possibility of declining inflation expectations. And what about a more hawkish direction? On that side, I think you need a substantial rebound of inflation. But be careful here. Just as below target inflation has not deterred them from slowing the pace of rate hikes, nor should a symmetric miss on the other side of the target by itself trigger an acceleration in the pace of hikes. As long as the medium-term inflation forecast can reasonable predict a return to target under the current policy path, they can retain that policy path. 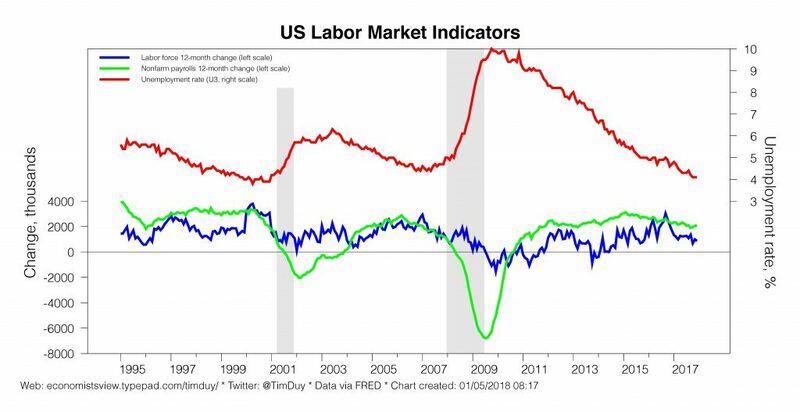 Hence, to step up the pace of rate hikes, I think they need not only higher inflation but also clear evidence that the labor market will not slow to a more sustainable pace without a more aggressive rate hike path. Regarding the composition of the FOMC in 2018, note that on Friday Philadelphia Federal Reserve President Patrick Harker said he thought two rate hikes were appropriate this year. I think then he is the sixth of the below median projection dots in the December 2017 forecasts. He stands along with Bullard, Evans, Kashkari, Kaplan, and Brainard. If these dot guesses are correct, then five of the six low dots are all nonvoters in 2018. Hence the composition of the FOMC members leans hawkish. This suggests to me that the data needs to break to the downside to shift consensus thinking toward dovishness. 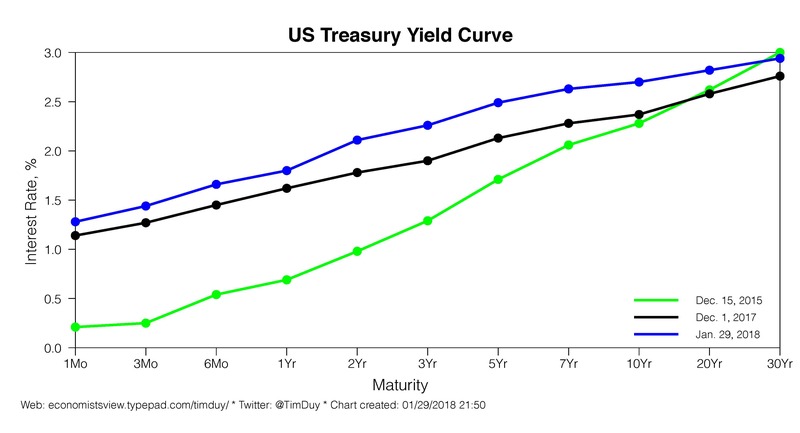 Also note that a possible yield curve inversion is something of a wild card for policy this year. Whether or not the Fed could continue to hike rates even after the yield curve inverts remains an open question. Bottom Line: The Fed looks on track for three rate hikes in 2018. If you are looking at weak inflation numbers as reason for the Fed to back down, be wary that the Fed will continue weigh the economic and jobs outlook heavily in their policy decisions. On the other side of the coin, central bankers will not overreact to a surprise rebound of inflation if they can remain reasonably confident their projected tightening is sufficient to return inflation to target in the medium-run. Quick post today as I am still settling back into the swing of things after some downtime during the holidays. Friday morning the Bureau of Labor Statistics delivers us the employment numbers for December. Wall Street anticipates firms added 191k employees, a healthy pace of job growth, while the unemployment rate holds steady at 4.1 percent. The consensus is also looking for wage growth of 0.3 percent for the month, or 2.5 percent year-over-year. Labor market conditions continued to strengthen in recent months, with the unemployment rate declining further and payroll gains well above a pace consistent with maintaining a stable unemployment rate over time. I continue to believe that central bankers can make all the noise they want about. low inflation, but, when push comes to shove, they will maintain the gradual path of rate hikes as long as growth growth remains solidly above the roughly 100k needed to hold unemployment constant. Third, tepid wage growth to date has reduced concerns that the labor market was past full employment, but has not reduced those concerns sufficiently for the Fed to back off rate hikes in 2017 or there 2018 projections. My expectation then is that continued soft wage growth won’t deter the Fed from continued rate hikes, but a more rapid acceleration in wage growth would easily help put a fourth rate hike in play for 2018. Bottom Line: My expectation is that the employment report supports either stability of the Fed’s three rate hike forecast or raises the possibility of a fourth hike. I doubt that we will see a report with more dovish implications; even if the report is soft, the Fed would likely dismiss it as an anomaly given the solid pace of other data in recent weeks.